First Bike Delivered In North America! Almost a century of tradition, passion, and significant commercial and sporting success; almost a century of magnificent motorcycles all built in Mandello del Lario, combining the best technologies with first-rate Italian manufacturing techniques: Moto Guzzi values since 1921. Moto Guzzi V85 TT is created in keeping with this strong identity, skillfully balancing that classic, evocative style with cutting-edge technical equipment. Presented at EICMA 2017, and having kept to its development and production schedule, the new Moto Guzzi reflects a construction philosophy in which simplicity, practicality and lightness make for an unfiltered relationship between motorcycle and rider. The TT acronym, already a part of Moto Guzzi tradition, is an ideal fit for the V85: meaning “tutto terreno”, or all-terrain, it identifies a motorcycle dedicated to travel in its purest and most original form, conjuring up clear images of desert adventures such as the Paris-Dakar. The famous African race was at its peak as the 1980s dawned... Taking center stage was man, ever intent on challenging nature and himself, in total harmony with his motorcycle. A compass, road book and watch were the only navigational tools with which to reach the final destination of Lac Rose, which remained just a dream for many. The goal was not just to compete, but to discover unique places, a value that V85 TT wants to reinstate. Moto Guzzi V85 TT is the new and original all-terrain that combines style features reminiscent of the golden age of motorcycle adventures with the content and functionality of a modern touring enduro. V85 TT is dedicated to those who, while still dreaming of the Dakar, seek a motorcycle that can also inject adventurous spirit into the everyday journey. The fundamental concepts at the heart of the V85 TT project are simplicity, ease and practicality, values typical of those 80s enduro bikes that could be used for anything, from the daily commute to adventurous trips, yet also values that are gradually getting lost in an increasingly homologated market, where ranges favor significant size and weight. Moto Guzzi V85 TT achieves its ambitious goal of combining a style based on said values with the needs of a modern touring enduro. This is why it deserves the title of classic enduro, dedicated to touring. Its design combines technology and functionality, with typical Moto Guzzi traits to ensure durability. The desire for simple shapes is clear: with no kind of fairing, the V85 TT is defined by the lines of its tank, its side panels and the front mudguard, as well as its brand-new sculpted 90° V-twin engine of course. Designed with proportions that are anything but prohibitive, accessible to riders of all sizes and experience, and narrow in girth to allow freedom of movement, the V85 TT ensures an optimal ride for rider and passenger. Comfort and usability are never compromised, for a motorcycle that is comfortable in two, even at full load. Air protection is ensured by a smoke plexiglass windscreen, its shapes researched in the wind tunnel; the pair of handguards installed on the handlebar protect extremities against bad weather and the cold, helping to make the V85 TT the ideal companion in any season. The design of the 21-litre tank (able to guarantee mileage of over 400 km) harks back to the tradition of Moto Guzzi bikes kitted out for African raids and boasts some meticulously crafted details, such as the slots on the front section and the recesses just above the engine heads, which appear to be generated by the twin itself. Extensive research was carried out in defining the contact area with the seat, in order to ensure optimum riding comfort when seated and freedom of movement when standing during typical off-road riding. The seat is 830 mm from the ground, allowing feet to easily touch for optimum control when maneuvering a stationary bike, also thanks to the compactness of the under body and an overall weight reduced to just 208 kg (dry weight). The riding position is erect, with relaxed back, legs that are barely flexed and correctly bent arms to effectively grip the wide variable section aluminum handlebars, for total control. Under the seat is a practical storage compartment. The high front mudguard and beautiful double front headlight are also in keeping with Moto Guzzi history, these stylish and functional solutions already present on the 1996 NTX 650 and the 1989 Quota 1000 respectively. 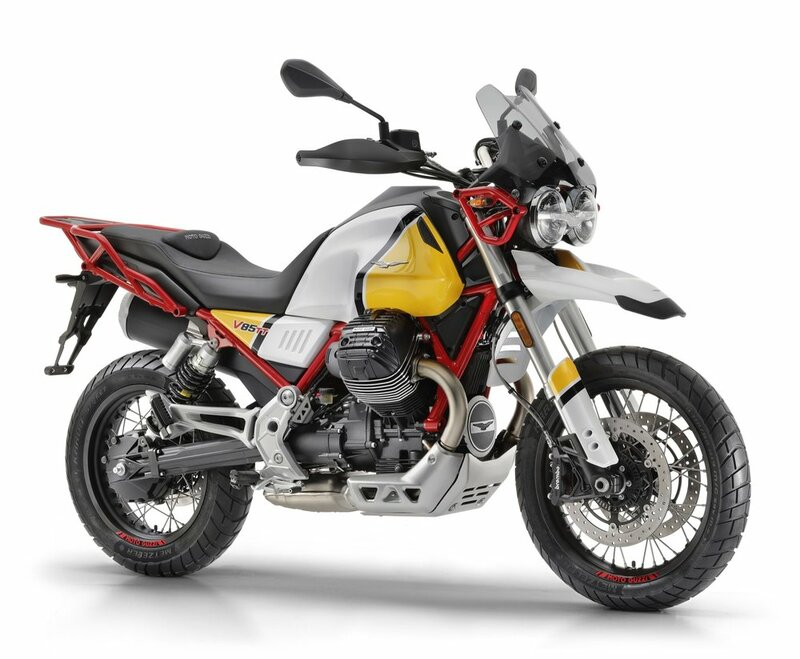 Classic all-terrain style features (including fork stanchion protection, an exhaust system with high silencer and the aluminum engine sump guard) are combined with technologically cutting-edge elements, such as the digital instrument cluster and the series of LED lights on the headlamp with DRL that trace the shape of the Moto Guzzi eagle. That Moto Guzzi ability to build superb chassis is once again confirmed with the V85 TT. Only the new Moto Guzzi can boast such a solid and precise front end as it enters a corner; only V85 TT is able to give the rider such a sense of control and safety while seeking excitement on the road. Much of this is down to the particular layout of the high resistance steel tubular frame, complete with beautiful rider footpeg support plates in die-cast aluminum (with removable rubber for off-road riding). 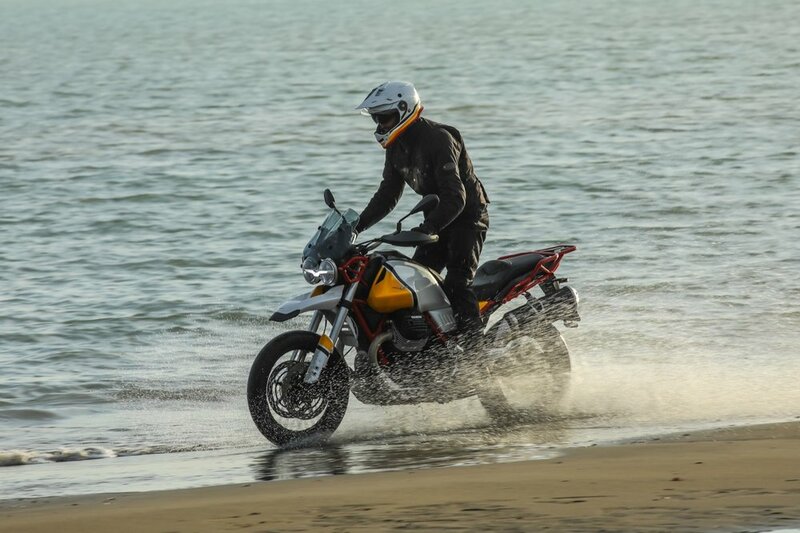 As well as being completely new, it has no lower cradle, thus reducing weight while increasing engine clearance from the ground, essential when it comes to off-road riding. In pursuit of lightness, rationality and accessibility, it exploits the specific anchorage of the engine to create a rigid structure that restores precision and rigor on the road as well as robustness as well as the right feel for off-road riding. The rear part of the frame is designed to optimize load capacity and offer the passenger two wide and practical grab handles. A case can be mounted on the practical rear luggage rack, while optional panniers can be fastened to the sides, for significantly reduced lateral bulk. Reduced longitudinal development of the new small block engine allows for a very long swingarm, for safe and intuitive riding. The new asymmetric unit in box-type aluminum features a curved left arm, for a very linear exhaust pipe design and a reduction of lateral bulk. The right arm of the swingarm houses the new shaft drive transmission. V85 TT is the only bike in its segment to use shaft drive transmission, prioritized over a chain drive because it makes no mess and requires no maintenance. The single shock absorber connects the chassis directly to the right arm of the swingarm, a solution that facilitates access to the hydraulic and spring preload adjustments, thus allowing free space for the exhaust system layout. The suspension offers very generous wheel travel (equal to 170 mm for both wheels) for satisfying off-road use, thanks also to significant engine ground clearance of 210 mm (the engine protected by an aluminum sump guard), while also ensuring comfort on the road. The fork (with 41 mm stanchions) and shock with separate tank are both adjustable in terms of shock preload and hydraulic rebound. The braking system is of superior quality, comprising a double 320 mm steel front disc with two radial-mounted Brembo calipers with 4 opposed pistons, connected to the pump at the handlebar with metal trellis tubing. At the rear is a 260 mm steel floating caliper with 2 pistons. The unit is controlled by a multimap Continental ABS system. The spoked wheels mount 17” and 19” tires (respectively 150/70-17 and 110/80-19), measurements that will also satisfy off-road enthusiasts. The V85 TT introduces a new Moto Guzzi engine. Its configuration mirrors that of all Moto Guzzi bikes in production today: an air-cooled transverse 90° V twin with OHV distribution and two valves per cylinder, the pride and tradition of the Mandello Eagle. Engine capacity is 853 cc, thanks to a bore to stroke ratio of 84 x 77 mm. The most modern of all engines in the range, it can boast a ratio of almost 100 HP/liter. Thanks to its complete new design and the use of materials generally destined for race bikes, such as titanium, the new "eight and a half" is able to deliver maximum power of 80 HP and boast an impressive maximum torque value of 80 Nm at 5,000 rpm, with 90% of the torque already available at 3,750 rpm, in keeping with the tradition of the Mandello twin, which has always offered excellent drive even at very low revs. This is the first Moto Guzzi small block engine that can easily reach 8000 rpm, an aspect that showcases its modern and exuberant nature. The crankcase is the fruit of a new design and is stiffer, in order to fulfil its new role as a stress-bearing element in the frame, introducing new frame connections and strengthening elements in the internal stud bolt area. It also features new ports in order to check the oil level in the lower semi-crankcase. Lubrication involves a semi dry sump, with two coaxial pumps tasked with oil delivery and recovery that ensure excellent lubrication and do away with the need for an oil radiator, thus reducing the overall weight. The semi dry sump solution allows for a totally isolated crankcase chamber, preventing any power absorption that would occur with a dry sump system, where the piston also has to overcome the counter-pressure inside the sump. The oil circuit is totally new and features holes of different diameters, with one of the two pumps transferring lubricant from the crankcase chamber to the sump. The latter is reduced in size to increase ground clearance and allow for assembly of the protective aluminum under-sump. The whole crankshaft is new and, together with the piston rods, also new, allows for a reduction in weight of almost 30% with respect to other small block engines, upping throttle response speed while significantly reducing any vibration. 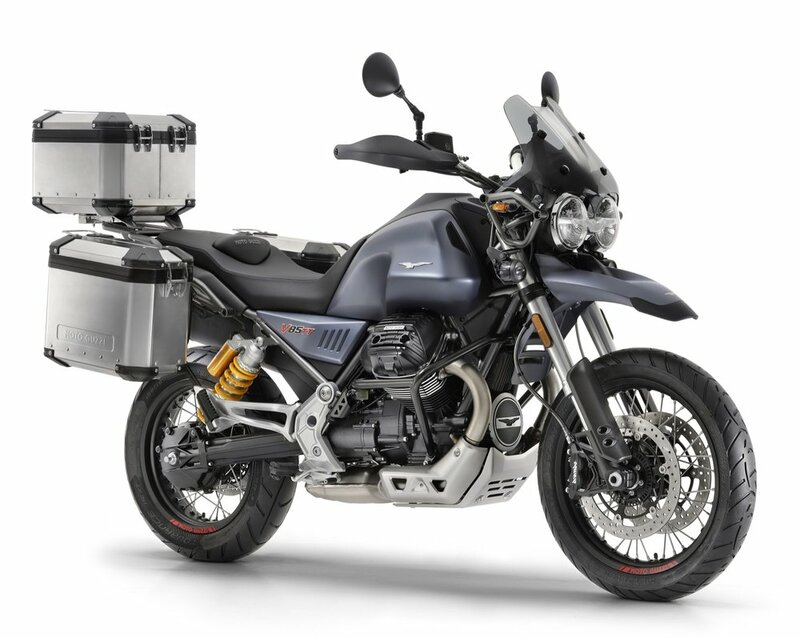 The upper section of the twin engine is also totally new: in keeping with Moto Guzzi identity, OHV distribution with two valves per cylinder is retained, though the system and materials used are all new. Cylinders are of reduced height, while new and efficient oil passages and a brand-new fastening system to the crankcase ensure robustness and reliability. The heads have new special-shaped mix entry ducts and links. One of the stand-out aspects of a Moto Guzzi engine is its distribution, complete with aluminum roller cams and rocker arm pushrods. The use of 42.5 mm titanium intake valves, which weigh half of those in steel, has allowed for much more radical opening timing, to the benefit of maximum power. Low-profile pistons are used, with 20 mm pins, as well as new head and plug covers that differ in shape, while the flywheel and generator have been boosted. Injection makes use of a single 52 mm throttle body, while electronic management is entrusted to a multimap Ride-by-Wire throttle control, a solution that allows for delicate and scrupulous control of valve opening, not only optimizing overall efficiency for a smooth, rich delivery, but also saving on fuel. The new Moto Guzzi engine is in fact very frugal in terms of consumption: it has few components that absorb power (OHV distribution is one of the most frugal in terms of power absorption) and has no cooling circuit pump or long drive chains or belts. Significant work has been done on the gearbox to make it smoother and more precise. The gearbox and clutch housing make for increased ground clearance; the dry clutch exploits a reinforcement disc under the clutch plate as well as a new clutch disc; a triple ring system is also introduced for the first time: a synchronizer that reduces gear noise to a minimum, particularly that of first gear. The ratios are new. In addition, the gears gain flexible coupling, for even smoother final transmission at the PTO shaft, this too new. Lastly, the swingarm housing zone is sized accordingly and features large diameter bearings. - Road: designed for smooth riding while still retaining an element of fun. Foresees a medium level of MGCT traction control calibration, ABS active on both channels and a prompt throttle response. - Rain: ideal in situations of reduced grip, to ensure maximum safety while riding. Foresees a higher level of traction control calibration, ABS active at both wheels and a gentler throttle response. - Off-road: the setting for the all-terrain soul of the V85 TT, designed to make the most of the chassis and engine during off-road exploits. Foresees the lowest level of traction control intervention, ABS only active at the front wheel with dedicated calibration (and with the possibility to deactivate it at the front wheel), along with a gentler throttle response assisted by greater engine braking. The rider need only select the preferred mode, safe in the knowledge that Moto Guzzi has developed the best possible electronic configuration for each Riding Mode. V85 TT is also equipped with Cruise Control, so that a pre-set speed can be maintained without acting on the accelerator. This system is also designed to make a rider's journey easier, just one button needed to activate and engage the system and increase/reduce the set speed. All travel parameters can be controlled via the digital instrument cluster complete with TFT display. The background and color of the characters adapt to different light conditions thanks to a built-in sensor. The information displayed, in addition to the classic speedometer, rev counter, mileage counter and clock, also includes selected gear indices, air temperature, fuel level, average and current consumption, residual autonomy and selected Riding Mode. It is also possible to set a maximum number of revs for the gear shift light sensor, useful when running in the bike or seeking to limit fuel consumption as far as possible. Alongside the display is a USB port while provision is made for a second port under the seat. Moto Guzzi V85 TT presents MIA, the new Moto Guzzi multimedia platform that allows a smartphone to be connected to the vehicle (via an ECU available in the rich catalogue of Moto Guzzi accessories), thus extending instrument functionality. MIA can be used to reproduce music and make/receive phone calls with the use of a helmet intercom. It also introduces a navigation function for the first time, allowing the rider to find and set a destination and view directions in the form of intuitive pictographs on the instrument cluster. Moto Guzzi boasts a solid off-road tradition: initial proof of this came at the Six Day Reliability Trial in 1939, which took place in Austria, where Moto Guzzi participated with the GT 20, winning four gold medals. This reliability trend continued in 1957, with the Lodola Regolarità, and then with the Stornello Regolarità in 1962. Moto Guzzi bikes have participated in various editions of the Paris-Dakar, albeit in an unofficial capacity, thanks to race versions prepared on the request of Guzzisti. Already present at the first 1979 edition with a modified V50, rider Bernard Rigoni managed to finish the race mid-field, a very positive result considering that the classification combined both cars and bikes at that time. Moto Guzzi motorcycles immediately earned the respect of the other manufacturers involved, due to the speed-related performance achieved by the 90° transverse V twin together with its reduced fuel consumption and excellent chassis stability. It went on to compete again in 1980 and 1981, though its most famous appearances are those of 1985 and 1986, owing to the great passion and dedication of a Guzzista architect called Claudio Torri, who commissioned the Mandello Test Department with building a very special V65 TT. The engine was based on that of the V65, tuned to 55 HP; the frame was significantly strengthened, while suspension was specifically configured for off-road usage. The original fuel tank was replaced with a 50-liter aluminum tank, while the swingarm was taken from the sporty Le Mans 1000. The bike behaved well, so much so that the French importer requested 16 units to sell to private riders for use during subsequent seasons; at the same time the importer also asked Moto Guzzi to develop a new model, based on the more high-performance V75 with four valve timing. The V75 TT was accredited with 62 HP that allowed for a top speed in excess of 170 Km/h. Both bikes are part of a collection of more than 150 models exhibited at the Moto Guzzi museum in Mandello del Lario. The V85 TT is designed to be equipped with a series of original accessories, to amplify the touring vocation of this adventurous enduro. All accessories are conceived, designed and produced by Moto Guzzi. They are all homologated and subjected to strict control test cycles just like any other original part on the bike in order to guarantee a long-lasting and high-quality product. Pair of side panniers: created in 1.5 mm aluminum, they are ultra-resistant and spacious (33-litre left pannier; 39-liter right pannier). The panniers are powder painted to offer maximum protection and durability over time. They are locked to the bike using a dedicated safety key and can be easily removed in just a few seconds. Additional lock blocks are supplied in order to be able to use just one key also for the 41-liter case. Opening from the top facilitates loading. Stainless steel supports are included in the kit. Internal bags and a thermoformed tray are available as accessories. 41-liter aluminum case: created in 1.5 mm aluminum, it is ultra-resistant and spacious. The case is powder painted to offer maximum protection and durability over time. It is locked to the bike using a dedicated safety key and can be easily removed in just a few seconds. Complete with stainless steel fastening plate. Larger windscreen: offers the rider greater protection during long trips. The anti-impact, scratch-proof polycarbonate sheet guarantees safety while ensuring that transparency and shine will remain unaltered over time. Center stand: created in cataphoretic and powder coated steel to stand up to different weather conditions, it has been designed and engineered to meet with the strictest safety and resistance standards. Larger stand base: created in anodized steel to stand up to different weather conditions, it is designed to offer a greater support surface area on irregular and uneven ground. Öhlins shocks: with adjustable compression, rebound and spring preload, they offer maximum comfort and safety in all situations. Moto Guzzi exhaust by Arrow: homologated in titanium with a heat protection cover, support clamp and carbon end cap. It reduces the weight and makes for a unique and aggressive sound. Shaft drive protection: Created with very thick steel tubes, it protects the shaft drive in case of a crash. Tubular engine guard bar: Created with very thick steel tubes, it specifically protects the engine and the rider's legs. Comfort seats: a complete range of seats that increase comfort levels thanks to a special 3D insert. Available in three different heights. Clutch and brake lever: machined from solid, they improve ergonomics by offering four-position adjustment. Additional LED lights: with an aluminum body and contained size, the lights use limited power. They integrate perfectly with the bike and allow for greater visibility and safety during night-time riding. Foldaway mirrors: They fold in on themselves towards the handlebar, to reduce bulk during off-road use. Mudguard: Created in injected plastic material, it is mounted on the shaft drive and protects the engine from stones and water. Sport Adventure tires: Michelin Anakee Adventure, as standard on special versions. High grip brake pedal: laser-cut and power painted in a resistant material. Ensures perfect grip even in the most extreme situations. Moto Guzzi Multi-media Platform: the new device that allows for a smartphone to be connected to the bike, transforming it into a real multimedia platform. Electronic anti-theft system: comprises a compact and technologically advanced ECU that is easy to install. Complete with remote control. The system is self-powered with minimum energy absorption. Light protection: an anti-impact, scratch-proof polycarbonate sheet. Protects the light from any impact or accidental damage. Particularly useful on off-road routes. Tool bag: created in leather, it can be affixed to the luggage rack with screws. Practical for keeping all those tools needed for an emergency repair (tools not included). Fuel tank cover: in adhesive 3D material, they provide superficial protection for the tank and limit rider sliding. Transverse 90° V twin, two valves per cylinder (titanium intake). * Weight with motorcycle ready for use, with all operating fluids and 90% fuel.